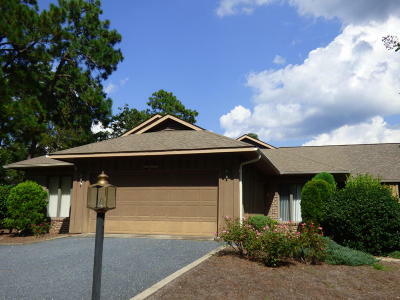 Golf front single level townhome in desirable Midland CC off scenic Midland Road in Pinehurst. Spacious floor plan with 9' ceilings and skylights plus 3rd bedroom for optional office/study or guests. Family/Carolina room off kitchen has fireplace and perfect for casual gatherings. Recent updates include hardwoods. Five skylights bring in lots of light. Garage is oversize one car with great storage and workbench, plus attic pull down stairs. Seller including $5000 renovation credit in price!